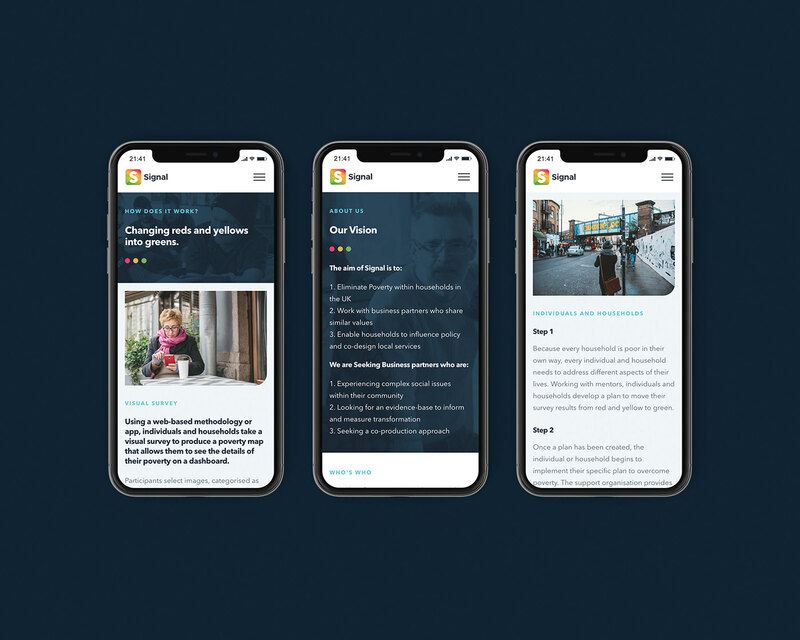 Design a logo for the Signal project and develop a website for UK individuals to visit, using as a reference to visualize the ways in which poverty affects themselves and their household. 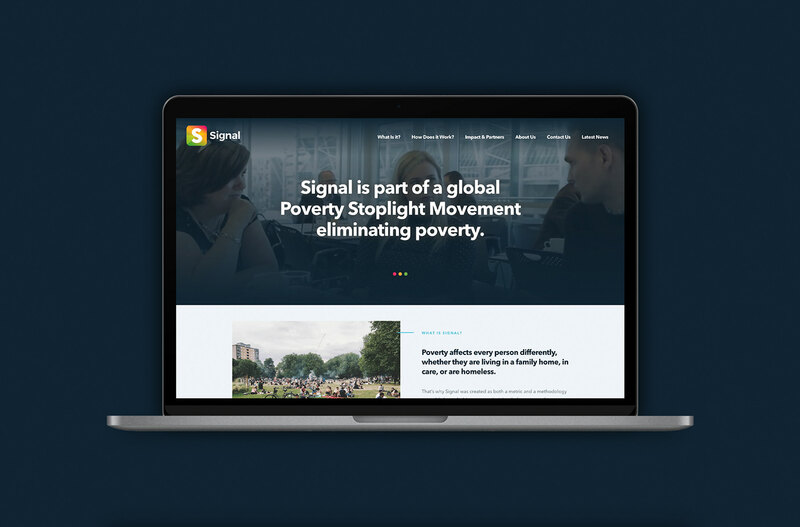 Signal is the UK name of the global ‘Poverty Stoplight’ project, licensed from Fundacion Paraguaya. Transmit Enterprise CIC (part of the Transmit Group) exclusively own the UK and European license. Transmit called the project ‘Signal’ because ‘Poverty Stoplight’ doesn’t have any meaning for the UK market (in Paraguay, traffic lights are called stoplights). The purpose of the global Poverty Stoplight project is to: "Eliminate multidimensional poverty, by empowering social innovators and families with tools to eradicate poverty at the family level". The mission is to "activate the potential of individuals and families to eliminate multidimensional poverty through self-evaluation tools that allow the discovery of practical and innovative solutions. Our vision is a world without poverty where we all want to live." The client gave us a completely blank canvas in regards to branding with the only instruction that it didn’t end up looking like the current ‘Poverty Stoplight’ branding. The brand was to be aimed primarily at local authorities (policymakers and commissioners, housing associations, citizen advice etc) but it had to appeal to the end user as well (the people taking the poverty survey). Whilst we were steering away from the ‘Poverty Stoplight’ branding it became apparent during the initial concepts stage that it was important to retain the ‘3-step’ aspect of the Signal process. After the first round of concepts was submitted it was decided we would use a similar colour palette to the ‘Poverty Stoplight’ branding as the Traffic Light colours worked effectively. The logo was developed further to incorporate two subtle ‘beams of light’ either side of the ‘S’ that were formed by the changes in colour gradients. They resemble the beams from a searchlight, representing a signal and an answer to those searching for help. Lastly, our client decided they would like the logo to be easily adapted and recognisable as an application icon on mobile devices. By housing the ‘S’ in a rounded square, the same as application icons already were, it meant the brand recognition wouldn’t be negatively impacted as it may have been if we’d housed it in a circle. We were left with a logo that met the original brief whilst also offered great opportunities to roll out the branding across multiple platforms, utilising the bright colour palette and gradients. We combined clean, contemporary style with excellent UI design. This meant visitors could easily access the information and help they required, which was essential for this project. The website was given structure by using subtle colour to help break up large amounts of copy. We felt this would aid in the education of individuals who were visiting the website hoping for guidance, and in turn helping important information be less overwhelming. 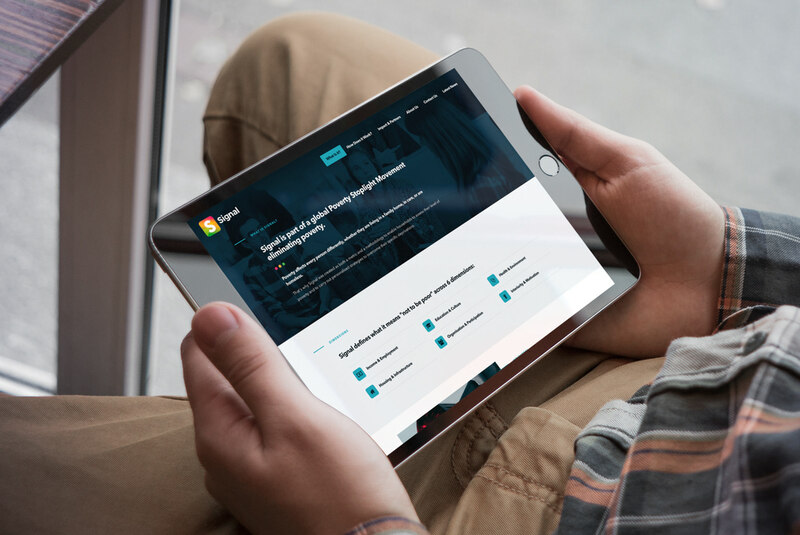 Overall the new Signal website has had a positive effect, presenting crucial information regarding Poverty in the UK and helping individuals to improve their lives and living standards. 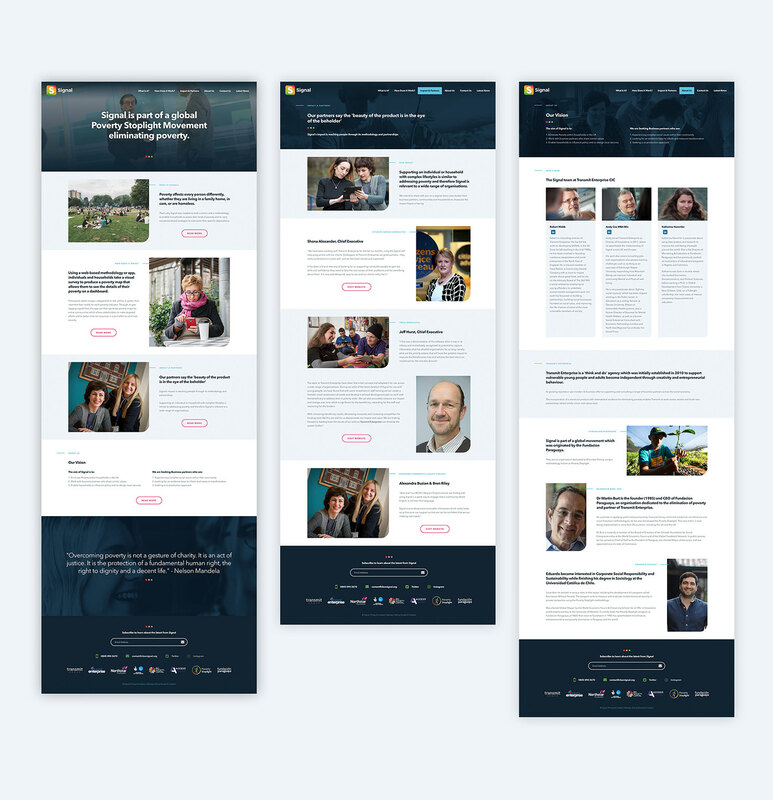 Website and branding for Signal, an online UK project to help eliminate multidimensional poverty.